In with the New! Recent Gifts on Paper, on display at the Pennsylvania Academy of Fine Arts until March 30, offers a wide variety of works for every taste, verging on narrative hodgepodge at times. Ranging from the 1940s until as recently as 2011, In with the New displays paintings, prints and drawings by both known and upcoming artists. Many of the works are gifts from the artist themselves or from the artists’ estates. This intimate show is quietly tucked away in the Richard C. von Hess Foundation Works on Paper Gallery, located on the mezzanine level of the ornate Historic Landmark Building. As someone who has made art, I particularly love looking at works on paper. The immediacy of that medium allows for an appreciation of each stroke of the pen or pencil—creating a direct link to the artist’s mind and process. Often, drawings are not meant to be a final product; they are less influenced by outside forces, becoming a more direct reflection of the artist’s conception of a composition. Additionally, the scale of this exhibit allows for accessibility and careful study of each work. In with the New arranges its new collection in a series of four small galleries with some truly intriguing juxtapositions. The subject matter and styles vary dramatically, from realism, to surrealism, to abstraction. One discovers meticulously rendered portraiture, surrealist storybook-like illustrations, and boldly-rendered impressionistic works, with some carrying direct social or political messages. While there is no larger overall theme guiding these works other than their being recent gifts to the institutions, there are smaller internal connections among different sets of works in different parts of the gallery. For example, in the first gallery, many of the works on display were created by artists who knew one another personally. 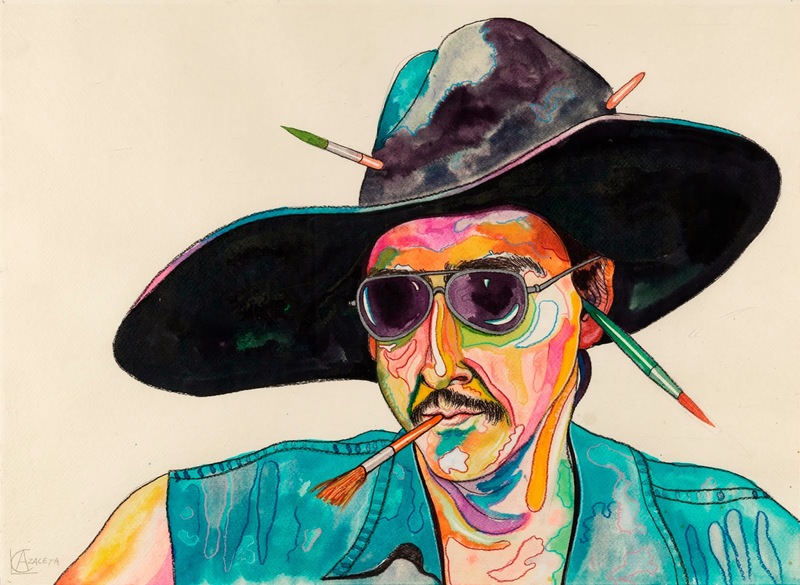 Luis Cruz Azaceta, Self-Portrait with Phony Hat, 1980, colored ink and pencils on paper, 22 1/8 x 30”, Pennsylvania Academy of the Fine Arts (PAFA). One of the immediate highlights is Self-Portrait with Phony Hat, a 1980 work, by in colored inks and pencil greeting the viewer in the first gallery. This vivid drawing by Luis Cruz Azaceta delights the eye with its dynamic line and psychedelic colors, cheekily addressing the “phony” nature of the artist, who presents himself, as such, paintbrushes stuck just so in his hat. With this gesture, the artist seems to be poking fun at the idea of the oh-so-serious artist who eats, sleeps, breathes and wears his art. With this self-portrait, Azaceta reinforces the popular view of an artist’s conceit with his contrivance of “accidentally” leaving paintbrushes in his hat. Also in the first gallery is William Beckman’s 1980 Study for Diana #IV, a marvel of a drawing transcending faint pencil lines to create a lifelike sense of real flesh and hair. Dorothy Dehner, Ballroom Ascension #2, 1947, Ink on paper, 22 3/4 x 17”, Art by Women Collection, Gift of Linda Lee Alter, 2011.1.74, Courtesy of PAFA. Ballroom Ascension #2 (1947) by Dorothy Dehner is a wondrous flight-of-fancy drawn in ink, which stands out immediately in the next gallery. 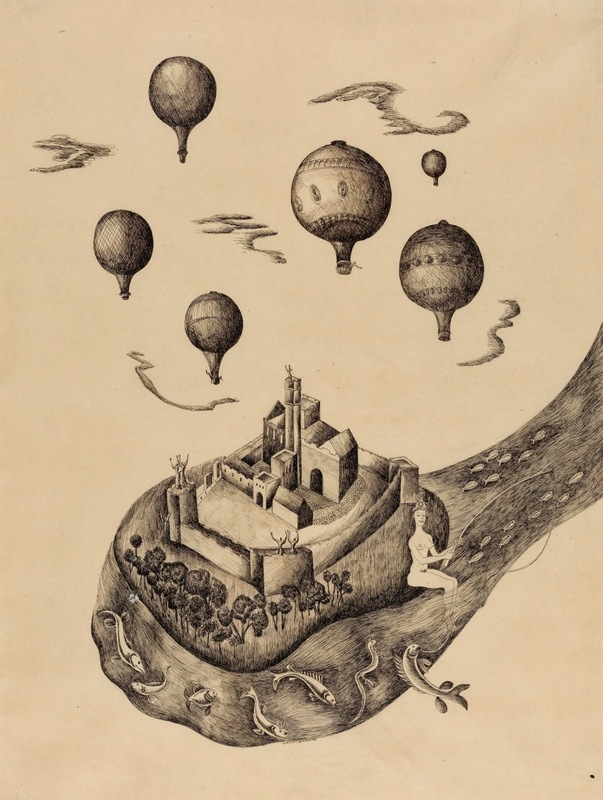 This work depicts a small castle nestled in what appears to be an extended paw. The biomorphic form is flanked by floating hot-hair balloons. This work conjures up a sort of child-like wonder and fantasy with a melancholy air; the hot-hair balloons are leaving this mysterious castle form and the female figure sitting by it, potentially symbolizing the process of leaving the magic of childhood behind as you grow up. 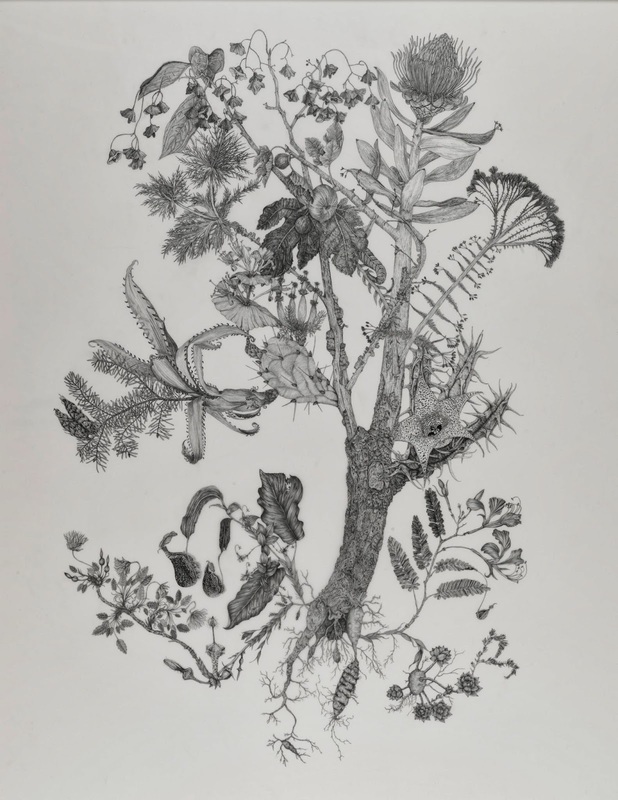 Similarly, Mutant Spectre, a 2010 graphite drawing by Leigh Anne Lester located nearby, flirts with the fantastical and strange with its detailed depiction of a bizarre, seemingly breathing plant. According to curator Bob Cozzolino, this winner of the coveted 2011 Hunting Art Prize was requested by the museum as a gift, because they felt it would be a strong addition to their prints and drawings collection, which it absolutely is. Leigh Anne Lester, Mutant Spectre, 2010, Graphite on drafting film, 39 x 31”, Gift of the artist, 2012.4, Courtesy of PAFA. Located in the same gallery is a divergent trio of works by Seymour Rosofky addressing a wholly different subject matter—socio-political issues. Haunts of the Very Rich, a 1973 watercolor, criticizes the ease with which the wealthy and well-connected manage to evade the struggles of the less fortunate by depicting a group of human forms in an airplane high above a burning landscape. Two works away, Television Viewers, by the same artist, utilizes the medium of blurry, wavy watercolors to critique the mindlessness of watching television, and how it creates a sense of lost time and unreality. While the social message of the works may not seem in keeping with the rest of the exhibit, the way it is juxtaposed with the more fantastical works in the gallery presents a striking perceptual contrast. Particularly of interest is the way Rosofsky modifies his technique to address each social ill; Haunts of the Very Rich uses a bold, slashing style to represent chaos and destruction, while Television Viewers blurs both paint and the lines of reality and what’s in the television. Taken in dialogue with the magic of the Dehner and Lester works, it paints a picture of adulthood and of reality as bleak and destructive. The former works are whimsical and fantastical, while the works by Rosofsky as well as Sue Coe’s Lo Cholesterol Buffalo, a densely rendered black-and-white image of the meat industry, deal with the darker realities of the world. 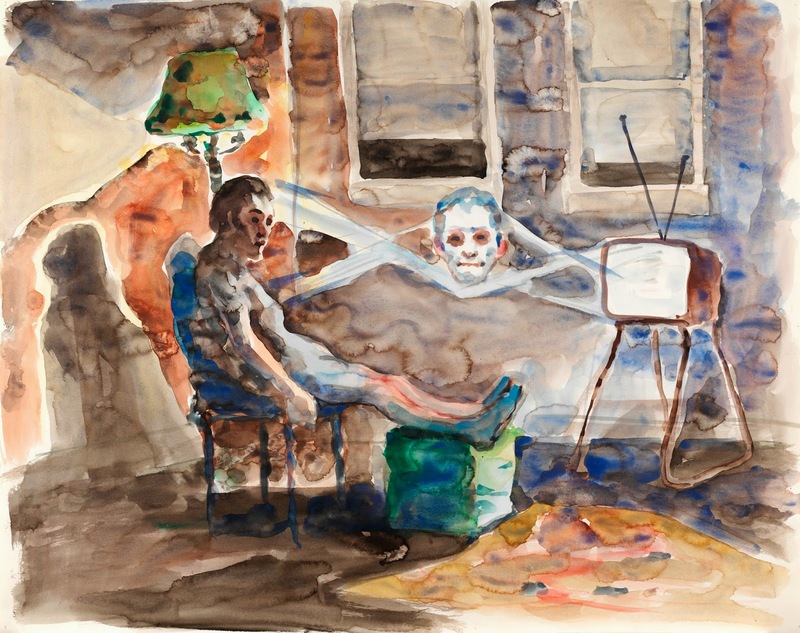 Seymour Rosofsky, Television Viewers, 1976, Watercolor on paper, 22 1/8 x 29 in., Pennsylvania Academy of the Fine Arts. In the same gallery is Samantha Mitchell’s 2011 Untitled Ball #2, an organic mass of gently intertwined strands that conjure up a loose ball of yarn, a mass of tangled hair, or an animated amalgamation of veins. This work suggests a connection, a similarity, between organic and inorganic matter; additionally, the sheer detail and effort put into each curving line warrants a good long while of examination. While the exhibit lighting suits the colorful works quite well, the dim atmosphere makes the more lightly rendered black-and-white pencil drawings are lost and thus a bit harder to appreciate. It is not clear that this lighting design was a deliberate move to protect the pictures, which can fade under bright light, or a slight miscalculation. Additionally, the more lightly rendered, intricate works are often juxtaposed with louder, bolder pieces, also causing them to get lost upon first glance. Ultimately, In with the New presents a strong collection of works on paper that any museum would be delighted to add to its collection. At times, the satisfying layout of the exhibit at a meta-level lends itself well to analyzing the works in question. The exhibition does lack a grander overall sense of theme and purpose, however. My only quibble is with the prevailing dim lighting, making it a bit harder to appreciate the works in pencil that particularly piqued my interest.